Okay, all my fine young animals, say hello and welcome to Annie who has sent us some really thought provoking pictures. She seems to have visitors in her bedroom and we're not talking just about dogs! These are some very, very good pictures and they are so clear. There's no doubt what's in the pictures. Although Annie will tell us her story, I think there's more than she is telling. Maybe she will be brave and further research these events and get back to us with her findings. We will wait most anxiously in hopes that she will satisfy us! Thanks Annie! 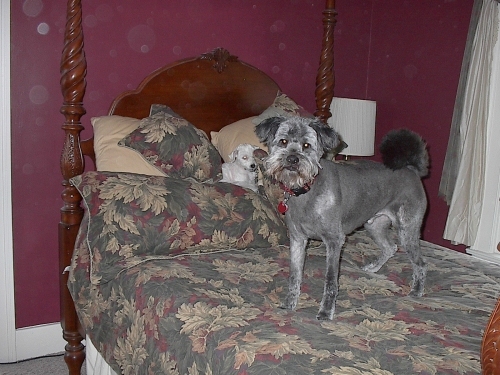 The dogs wouldn't come down off the bed the other day..So I took their picture. Photo 1. What are all of those rings? Photo 2. 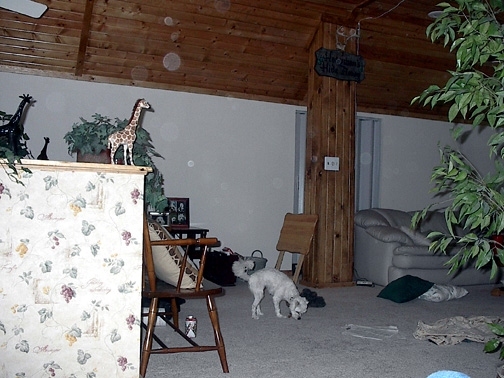 After downloading pic 1 I decided to retake that room and that is what I got. Thinking my lense was dirty or the flash was being picked up by something I took another picture. Picture 3: Look in the mirror. Do you see her? No other room has rings when I take pictures. No other room has anything like these. I can only see them with the camera and only in this room. I can't explain the circular shapes of light. They aren't in the same place each time. My headboard is new and not old and faded looking or burnt like it looks in pic either. There's other things such as noises at the same time of the day. But THAT's another story. The noise happens exactly the same at either: 10:35 am or pm OR 3:30 am or pm. It's the sound of 2 chairs being pulled on a wooden floor, then the 2 people sit down and start chattering. I CAN'T MAKE IT OUT and it's driving me crazy, but I want to know what they are so excited about! Maybe I will try and record it sometime. 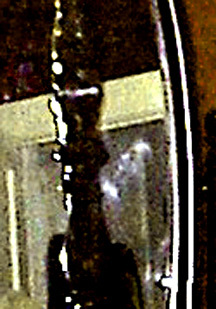 If you look in the mirror you can see the face, but look behind that far left on the door - see the girl? Long braid and long dress? There's a guy up in the far right corner too smiling, and if I enhance the picture it's very easy to see what that is above the face and between the 2 bedposts: a woman and her little baby. Thanks Janet! Oh no, thank you! What a busy room! It reminds me of my bedroom. I'M NOT KIDDING, I've had ghostly experiences in my room as well BUT that's another story! Thank you so much, Annie, for sending the pictures and the information. There is something truly happening in your room and I hope you find out what's going on so that we can know too! Annie has sent us two more pictures! These pictures are getting better and better. 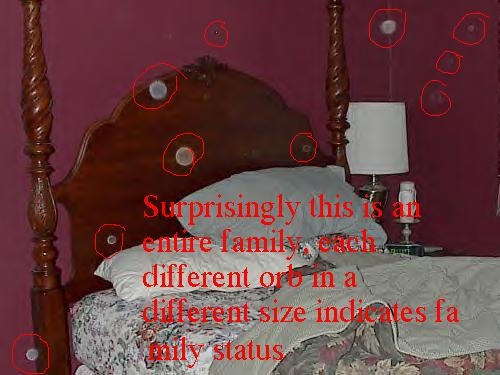 She has a different face in the same mirror and lots of orbs in a completely different room! This is really getting interesting! Thanks so much for sending them so soon, Annie! Don't you just love it? Thank you Annie and thank you to our ever professional, the Ghost Tracker. Okay, now our latest update from Annie, who emailed me the other day and brought it to my attention that the woman in the mirror that the Ghost Tracker spoke of is NOT the woman Annie was talking about! We've got two distinct women in this mirror and if you look even more closely, well, let's let Annie explain. This is so kewel! Hi Janet. It's me Annie. I saw your writing over the top of my photos and you might have missed the real amazing part of the one mirror shot. Here it is blown up. See her face now? She's looking almost eyes closed upward. I have attached. Love your site. Much happening. Someone forwarded my pics from your site to an author of ghost book. They are contacting me now and may even visit. It's amazing what's happening here now. 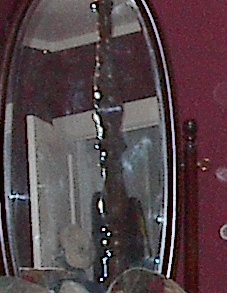 Thanks for reading..look at the attached and compare to the full mirror shot would you? Thanks...I just don't want you to miss the coolest pic I gave you and that face. 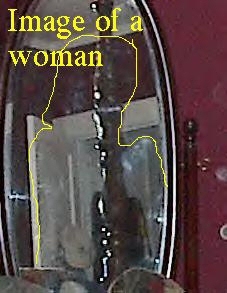 You have her drawn over included as the shoulder of a larger woman figure (which I missed). Also on that shot look at back closet door for braid of standing girl and in the upper right hand corner for the bald guy. Thanks. This attachment is only a blow up and enhancement of her face to compare. 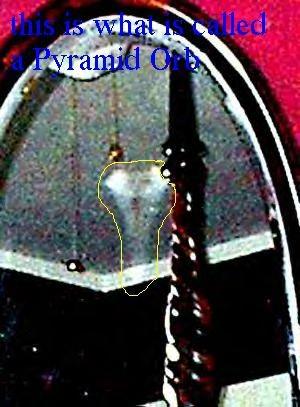 ALso in the pyramid photo that you highlighted..look at original. See the eyes and brows and mouth? Flesh colored too..strange huh? Thanks Annie. I'm quite astonished with what was right under my nose the whole time. Please all, do keep me straight here! Mustn't miss a thang! Please do make sure I'm seeing everything I should. Also, wouldn't you know that the Ghost Tracker would find a different ghostly woman than what Annie was speaking about! And Annie, I was so pleased to hear that the book people contacted you. WOW! Please if you do get your ghostly companions published, you must mention Halloween's Unseen! I'm not the least bit above a shameless plug for my ghostly domain! Okay? Okay! And I might add, that guy looking out at us in the pyramid photo is true freakiness. It's as if he's looking through some sort of veil. I'm going to venture a little further here - possibly through the veil between the other side and our dimension?! Do you think?